My projects this week have been all about the stripes. I haven't touched my Flower Market Shawl since you last saw it, though I'm hoping to put in some serious time on it this weekend. Instead, I've been focusing on my Plummy Mitts for my evening knitting and Rainbow's Vanilla Is the New Black socks for lunchtime knitting. 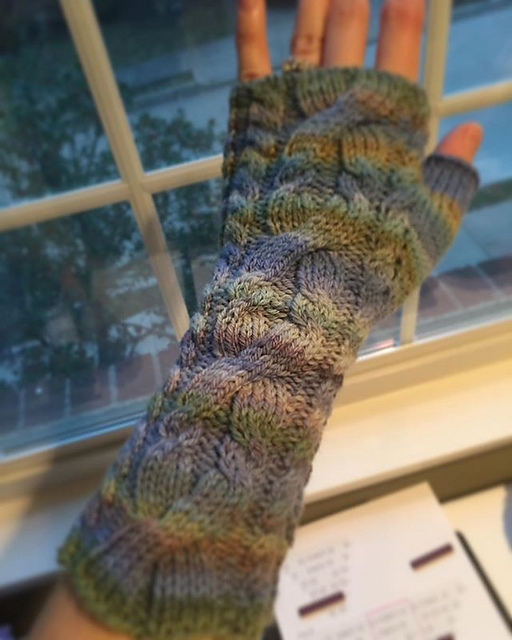 I finished up the first of my mitts last night and it fits perfectly! I'm hoping that the yarn blooms a little more when I block these, because there were definitely a few spots where it was a bit on the thin side and the fabric is a bit see-through. I've already gotten started on the second mitt, and I anticipate having a finished pair by next week. Meanwhile, I have finished up the heel and moved onto the foot of Rainbow's socks, and they are continuing to delight me with their colors. I'm a tad bit concerned that these might be a bit big on her (because I tried them on and they fit me, albeit tightly), so I may go down to the smallest size for the next pair. The heel was fun to knit on these, and I'll be interested to hear how she likes it as compared to the heels she's experienced with the previous socks I've knit her. Sizing concerns aside, the pattern is easy and a lot of fun, and I'm really enjoying the yarn. It's been a while since I last knit with Felici, and I swear it's gotten softer. I'm not sure how that will translate into wearing well, but at least with Rainbow she's more likely to outgrow her socks before she wears them out. The weekend ahead looks relatively calm, so I plan on filling it up with lots of knitting and spinning time. December has really snuck up on me and there's less time than I thought I had to get things done, so I'm going to need all the time I can get! 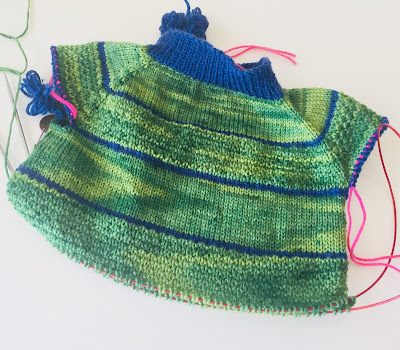 Remember the last couple of weeks, when I was decrying the fact that I was feeling totally unenthusiastic about my knitting and wondering where my mojo had gone? I'm happy to report the feeling has completely left me and I am completely enthused by my current projects thanks to the Indie Design Giftalong. I've got three projects on the needles that I'm actively working on, and I'm enamored with them all. First up is the only real gift that I'm knitting, and that's a pair of Vanilla Is the New Black socks for Rainbow. These are being knit in a lovely, bright colorway of Knit Picks Felici called Hopscotch. I'm nearly halfway done with the first sock (if you consider the heel the halfway point), but these should move along very quickly given that the heel is the only part where I really need to pay attention. I started these over the weekend but didn't get too far, as I could only work on them when Rainbow wasn't around -- I really want these to be a surprise! These will be one of her Chanukah presents, and for now they're my designated lunchtime knitting. The other two projects are both for me. One is the Flower Market Shawl, a pattern I bought last year and that has been patiently waiting for me to find the perfect yarn for it. 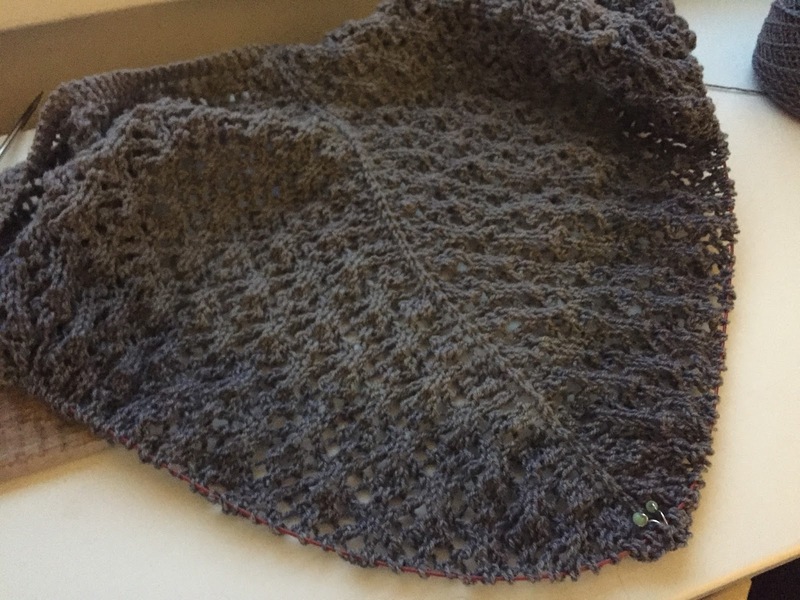 I realized that the faded skein of yarn I spun a couple of months ago had just the right amount of yardage and would look really great in this pattern, so I didn't waste much time in winding the skein and casting on right after the GAL officially kicked off. I'm in the middle of my fourth (of eight) repeats of this motif, and the rows are just starting to get long enough that I notice they take me a little while. The other project is, coincidentally, also being worked in handspun and using a pattern I bought previously. It is a set of Plummy Mitts that I'm knitting up in the skein of Gwen Erin Targhee I finished earlier this month and couldn't bear not to keep for myself. I think it was a smart move, because I really love how the first mitt is knitting up. I'm part of the way into the thumb gusset, and I think if I can get in a decent amount of time on the first mitt tonight, I should be close to finishing it up (if not actually finishing it). My plan is to use these mitts at the office to keep my hands and wrists warm; despite the fact that there was extensive work done in the building last year to make the HVAC system more efficient, I am still always cold because the air conditioning comes on pretty much every day and the heat never seems to. Fingerless mitts should make a bit difference while still keeping my fingers free to write and type. If I happen to be really productive and finish up all these projects with time still left in the GAL, I'll be casting on another pair of socks for Rainbow as well as a baby sweater for a baby that is due very, very soon (I totally dropped the ball on that one, but at least a baby sweater is a quick knit). One thing at a time, though -- I'm determined to keep this GAL all about enjoying myself and not overdoing it. If you still haven't taken advantage of the big GAL pattern sale, here's your reminder that it ends at 11:59 EST tonight! You can find my bundle of sale patterns here. 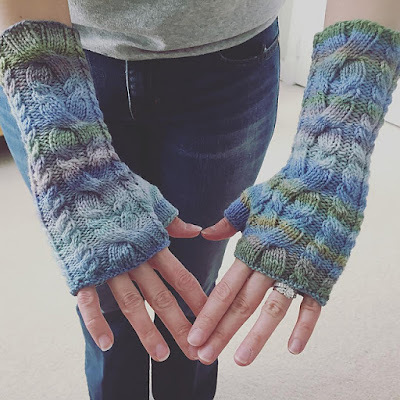 You don't have to buy new patterns to participate in the fun, though -- if you already have patterns by participating designers in your library, you can use those! I'd really encourage you to come join the Ravelry GAL group and have fun chatting and playing the games. It may seem a little intimidating because it's a big group and the chat moves quickly, but you can jump in anywhere you like! Usually Thanksgiving is a relaxing holiday for me, but with us hosting this year, it turned into an exhausting one. Don't get me wrong, it was a lot of fun and we'll happily do it again last year, but I didn't get as much time to craft as I have in years past, and what crafting time I did have was primarily when I didn't have a lot of mental energy left. Fortunately, spinning is perfect for those times, so I've been spinning a fair bit over the past few days. My main project has been my sweater spin. 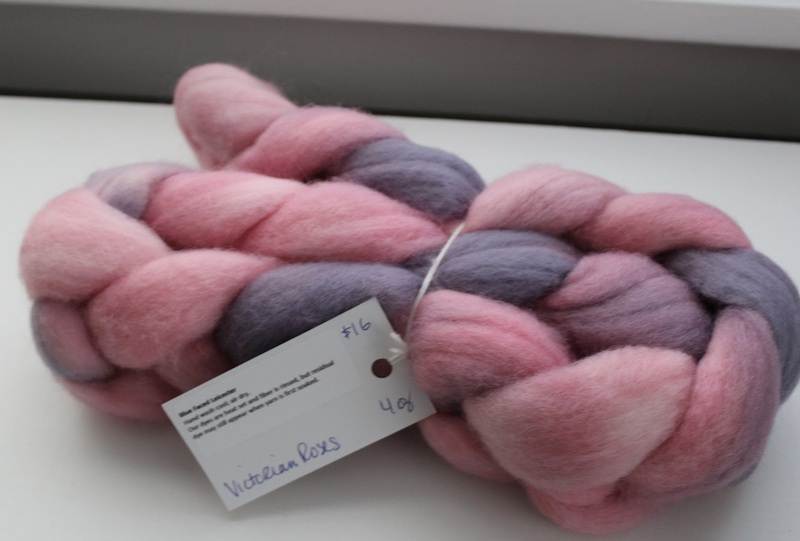 The first skein was finished and washed last weekend and is just beautiful. It's so hard to capture all the subtle shades in this yarn (6 oz. of HipStrings Buoy in Mussels). The yarn definitely fluffed up a bit in the finishing, so my final yardage was a lot less than I was expecting or hoping for -- only 350 yards. I blame the poofing and the BFL content; my yardage always seems to be on the low side when I spin BFL. I'm already well on my way on the second skein, which is 4 oz. of Bay, the darker blue color. One bobbin is done and I'd estimate I'm halfway done with the second. I'm spinning these little bits of fiber, which so far have ranged from 7 to 10 g, in the order in which they're opened onto the same bobbin. When the bobbin is full, I'll chain ply all the singles. The resulting yarn will be a bit crazy, but I kind of like it. If you haven't had enough photos for today, I'll share one more. Yesterday morning, Rainbow and I drove out to the HipStrings studio for their Small Business Saturday event. Because I got such low yardage on my first Buoy skein, I decided to pick up one more braid of each of the three colors as an extra bit of insurance, and we picked up a few more things from her sale bins while we were there as well. In the back (left to right) is some superwash Targhee that Rainbow picked out for me to spin and knit into socks for her, some cotton (yes, I may be crazy) to attempt to spin on my wheel, two skeins of sock yarn that I'm going to use for a baby gift, and some Polwarth/silk. Clearly I have a lot of fun spinning time ahead of me!